The Academic Leadership Development Program (ALD) provides Tufts faculty with tools and skills to navigate the diverse issues that arise with academic leadership positions. The need for such a program was identified by the University-wide Committee on Teaching and Faculty Development and the Department of Human Resources to address the challenges routinely faced by faculty and academic staff in leadership positions. 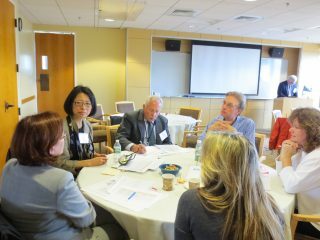 With more than 100 faculty participants, Tufts’ ALD provides a confidential and positive learning environment to discuss topics associated with academic leadership and develop skills through applied exercises. The ALD Program has received extremely positive feedback from all participants; they report greater understanding of their multi-faceted roles as academic leaders, increased self-awareness and confidence, and improved capacity for problem solving. They also value the important opportunity to establish an ongoing network of colleagues from across the University. Based on feedback and the changing environment for Academic Leaders, the ALD has been redesigned in a new hybrid model. The program will consist of four on-line interactive modules, one each semester starting in the Spring of the academic year. These modules will address: (1) Coaching and Mentoring, (2) Leading Change (3) Building a Diverse Community and (4) the Basics of Management including budgets and day-to-day operations. Participants will complete the ALD program over the course of two years. This will allow for sustained engagement of members and the ability to complete the module as conveniently fits into busy faculty schedules. Each semester will begin with a face-to-face meeting to introduce members to each other and to set the stage for the module. Faculty will then meet for one hour (in person or virtually) at mid-point for check in and discussion. They will also meet for one hour at the end of the semester to debrief the learning, answer questions or address challenges that arise that semester as well as introduce the following semesters module. The program will be offered this spring semester to a group of up to 20 academic leaders from Tufts’ schools and academic programs from across all campuses. The program is co-sponsored by the Office of the Provost, the Center for the Enhancement of Learning and Teaching (CELT), and Tufts Employee Learning and Development (TELD).